Sometimes I have questions or comments where people ask me how I manage to do so many activities with my child while she goes to school, is engaged in extra-curricular activities and I work full time. This post will explain how our days usually look like during a school year. Our school ends at 2:35 pm and after school time begins, but three out of these days my daughter attends an onsite Y after school program and two other days she will be engaged in a school play rehearsals, so usually Smarty arrives home at around 4 pm. The good news is that she arrives with a completed homework – our school gives reasonable amount of homework, which Smarty never took more than 20 minutes to complete. However, if your child is like mine, she or he is absolutely fried after a long day in school. Over the years I learned that it’s useless to try to engage Smarty in any sort of “guided” activity until later in a day. This is why she has an unstructured time until about 5 pm which she spends in one of her favorite relaxation activities – reading or playing computer games. That gives her some time to unwind and switch into a more relaxed state. We live in a climate that allows a lot of outside time, and even though Smarty spends time outside in school during recess and PE, I also want to make sure that she spends time outside at home every day. Usually we go for a walk before starting to get ready for dinner or, if time allows, play tennis or other outside games. Walks are my favorite time with Smarty, because that’s when she is most likely to share what’s on her mind. Then we go back for dinner prep and for chore time for Smarty, because having her help around the house also matters a lot to us. She sets up our rice cooker, sets the table and sometimes helps with salad or potatoes. While dinner cooks, she drifts off for more unstructured time (usually reading). We usually wrap up dinner at around 7 pm, and this is the time when Smarty “rebounds” from her afternoon slump and not all interested in going to bed, so we have one productive hour before starting a bedtime routine. This is when we can do activities that involve more thinking and creativity. Sometimes we play board games, draw or color, or watch something on TV or YouTube. Right now we are also trying out Stanford Mathematics program (5th grade) during this time, but I am hoping to discuss with Smarty’s teacher about possibly assigning this activity as math homework going forward. We are trying to keep to the rule of no screen within an hour before bed. On school nights, the light is off at 9 pm. Smarty has a choice of how quickly she wants to go through her bedtime routine to leave some time for reading before we reunite for our 15 minute cuddle ritual. It’s my other favorite time of the day when we get to giggle or reflect together. Life happens. We all have days when we are simply not up to any sort of structured activities because Smarty is tired or I am tired or I have higher workload at work. We also have special events, playdates, or activities that just simply take longer. The trick is not to stick to the routine no matter what, but to be mentally flexible and return to it when we can. 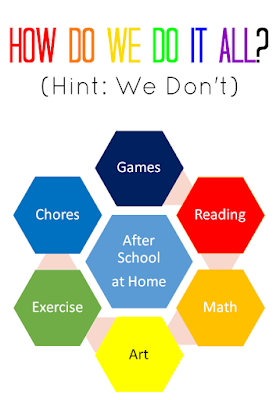 If you do not homeschool, how do you structure your time with your kids during a school week? My daughter is older now so she structures her own time, but we followed a similar schedule to yours. It's important to optimize the best time for your child. I love your approach! 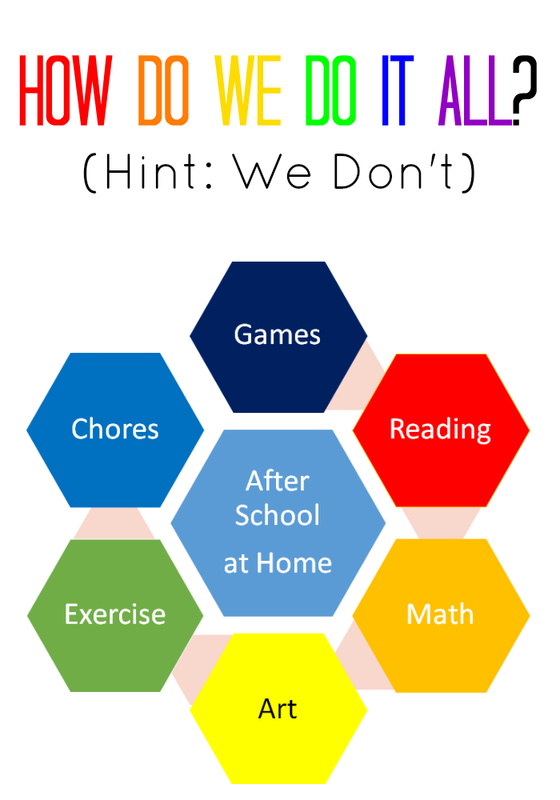 We usually have an after schools snack, then the kids do homework/practice, and then they get free time until dinner, followed by free time until bedtime. Your school gets out earlier than our elementary school's here. They get out about 10 minutes later, which may not seem like much, but it sure does when I'm watching parents picking their kids up. Of course our local elementary school is also fairly big, around 500 or so students.